The scatterplot is a common type of visualization that represents two sets of corresponding values on two different axes. Remember,  means array, so nested hard brackets [] indicate an array within another array. We separate array elements with commas, so an array containing three other arrays would look like this: [,,]. Now you can see that each of these 10 rows will correspond to one point in our visualization. With the row [5, 20], for example, we’ll use 5 as the x value, and 20 for the y.
svg.selectAll("circle") // No longer "rect"
.append("circle") // No longer "rect"
Notice how we access the data values and use them for the cx and cy values. When using function(d), D3 automatically hands off the current data value as d to your function. In this case, the current data value is one of the smaller, subarrays in our larger dataset array. When each single datum d is itself an array of values (and not just a single value, like 3.14159), you need to use bracket notation to access its values. Hence, instead of return d, we use return d and return d, which return the first and second values of the array, respectively. Don’t believe me? Type in dataset or dataset on JS Bin, and see what happens. Maybe you want the circles to be different sizes, so each circle’s area corresponds to its y value. As a general rule, when visualizing quantitative values with circles, make sure to encode the values as area, not as a circle’s radius. Perceptually, we understand the overall amount of “ink” or pixels to reflect the data value. A common mistake is to map the value to the radius. (I’ve done this many times myself.) Mapping to the radius is easier to do, as it requires less math, but the result will visually distort your data. Yet when creating SVG circles, we can’t specify an area value; we have to calculate the radius r and then set that. So, starting with a data value as area, how do we get to a radius value? You might remember that the area of a circle equals π times the radius squared, or pass:A = πr2. Let’s say the area, then, is our data value, which is ++d++, in this case. Actually, let’s subtract that value from h, so the circles at the top are larger. So our area value is h - d.
After arbitrarily subtracting the datum’s y value d from the SVG height h, and then taking the square root, we see that circles with greater y values (those circles lower down) have smaller areas (and shorter radii). This particular use of circle area as a visualization tool isn’t necessarily useful. I simply want to illustrate how you can use d, along with bracket notation, to reference an individual datum, apply some transformation to that value, and use the newly calculated value to return a value back to the attribute-setting method (a value used for r, in this case). svg.selectAll("text") // Note "text", not "circle" or "rect"
This looks messy, but bear with me. Once again, we’re using function(d) to access each data point. Then, within the function, we’re using __both__ d __and__ d to get both values within that data point array. The plus + symbols, when used with strings, such as the comma between quotation marks ",", act as append operators. So what this one line of code is really saying is this: get the values of d and d and smush them together with a comma in the middle. The end result should be something like 5,20 or 25,67. Go ahead and edit the final scatterplot code below. Hopefully, some core concepts of D3 are becoming clear: loading data, generating new elements, and using data values to derive attribute values for those elements. Yet the image is barely passable as a data visualization. The scatterplot is hard to read, and the code doesn’t use our data flexibly. 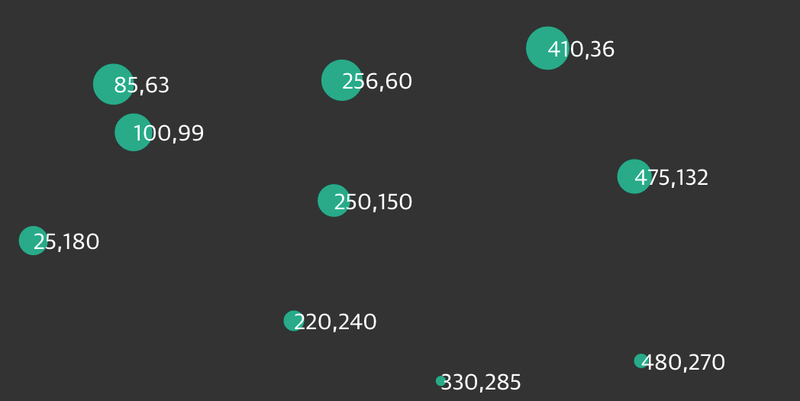 However, generating a shiny, interactive chart involves taking our D3 skills to the next level. To use data flexibly, we’ll learn about D3’s scales.